Orange is the new Depp. Here’s Hanson: Hanson and Penhall once again don the personas of the trouble-making McQuaid brothers to root out crimes on the inside. It eventually becomes more than just another case for Hanson, as something about being locked up has him confronting his dark side. 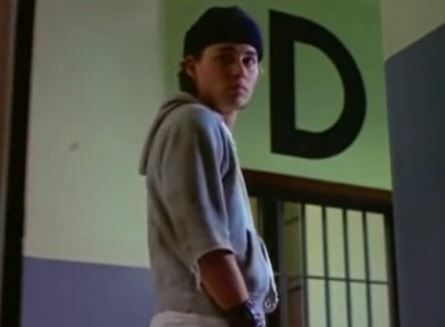 Penhall’s prerogatives: In a spectacular bit of unprofessionalism, Penhall calls his girlfriend Dorothy to let her know he’s OK, but the bad kids are listening, so he can’t break character when on the phone with her. He later starts to freak out with claustrophobia. Book ‘em: Booker and Ioki are also behind bars, as “the Samurai,” in their matching black bandanas. Booker tries to get in with the tough kids who, even if that means picking a fight with the McQuaids. Undercover blues: When the McQuaids are framed for having drugs, they end up in solitary. 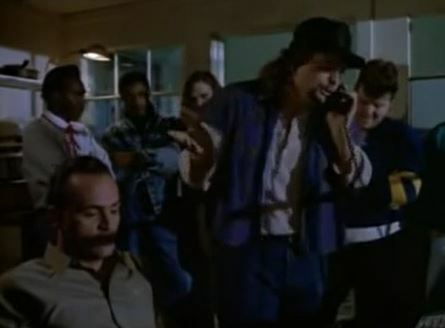 After this incident, though, Hanson becomes the “Hammer,” the one prisoner secretly controlling all the contraband coming in and of the place. Goin’ to the chapel: Somehow, the four cops are sent undercover without Captain Fuller’s knowledge. He was, we’re told, away on a long vacation when this happened. Trivia time: The old cartoon the teen prisoners watch on movie night is the 1941 Warner Bros. classic A Coy Decoy. Jumpin’ or not? The creators have gone overboard in loading this episode with every “prison movie” cliché they could think of. That’s part of what makes it work, though, in that everybody involved really goes for it. The episode is total melodrama, but somehow it works. It’s jumpin’! Next: Love? Don’t think so.